Carolina Home and Garden house tour! Hi everyone, I’m Pam from diy Design Fanatic. Debbie and I met over at RMS and I was one of many who encouraged her to start a blog. We are all so glad she did! I’m so happy to be sharing my home with all of you today. It is definitely a work in progress. We moved into our home almost twelve years ago and it looked quite different then. Our “landscaping package” included 1 small tree and 22 shrubs and all the walls inside were that stark builder white. It’s a good thing we are diy’ers because the house needed a lot of work, even though it was new. Come on in…Our cat Kelly is here to greet you. Here’s the view of the Foyer looking back at the front door. The “Piano Room” is just to the left as you come in. Would love to redo this as my office since our piano player now lives in California. When our daughter’s were little, they called this room the “Thanksgiving Room” because we only had dinner in there on holidays. Our Family Room is right off the Foyer and soon will be painted a new color. We’ll skip the Laundry Room and the worlds smallest Powder Room which is also on the main floor and head on upstairs to the Guest Room. The next bedroom was our Oldest Daughter’s Room before she moved to California last May. Take all the artwork and accessories out and that’s what it looks like today. Our Youngest Daughter’s Room has my favorite furniture transformation in it. The bookcases were a really ugly Craigslist find. We use the Bonus Room as our Craft Room/ Office. It’s on our project list for a complete makeover. Can’t wait. One of my favorite places to relax is the Basement Patio. It’s below the deck and stays cool until the very hot days of Summer. The patio was installed by my husband several years ago. I love gardening and designed the landscaping and we planted everything ourselves. It’s a good thing I love digging in the dirt! 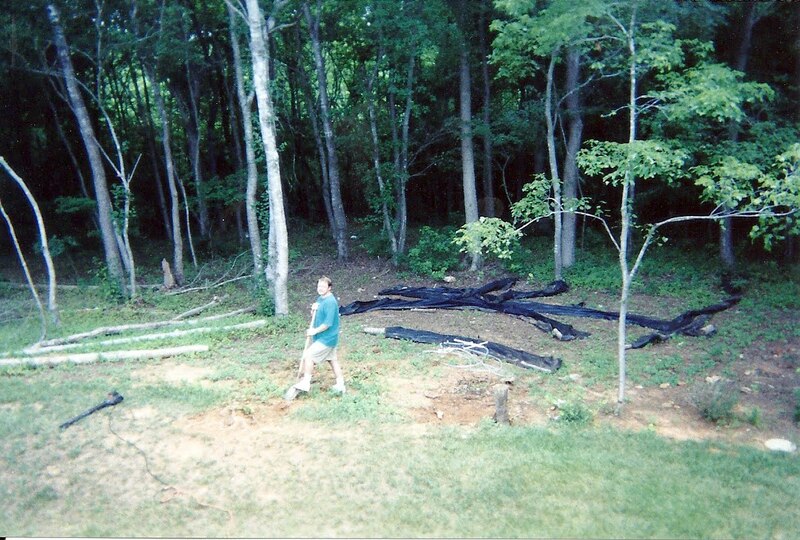 Just thought I’d throw in a scanned photo of how our backyard looked the year we moved in. We had already taken down a few trees to make room for a swingset for our daughters. The patio shown above now sits where the black plastic strips are. My husband is shown here trying to dig out one of the tree stumps. He eventually rented a Bobcat to dig them up. It’s taken many years and a lot of time spent out in the garden to get our yard to look like it does now. Debbie, thanks so much for featuring me and sharing my home with all of your friends! If you do not know Pam, head on over to say Hello! She always is up to something fun! Thanks for featuring my home Debbie! Hope you have a Happy Mothers Day! Debbie I LOVE Pam’s beautiful home and GORGEOUS grounds!! She’s a sweetheart! Thanks for sharing it with us! Pam’s home is always perfection! She gives such attention to the details that it makes it so special! Thanks for sharing Debbie! Pam has a gorgeous home and I love your property, too. Thanks for sharing Pam’s home with us, Debbie! Happy Mother’s Day to both of you! Pam’s home is so beautiful – inside and out. Thanks for sharing it with us! Happy Mother’s Day, Debbie Dear! What a gorgeous home and property….i am loving her craft room….as I just have a “craft corner”…oh one day! Thanks Debbie for featuring this beautiful home!! and…Happy Mother’s Day!! Pam’s home is out of this world gorgeous. The grounds are perfection. Thanks for sharing. Love the whole house, but the garden inspires me to get outside! Thanks for sharing! The house is beautiful, and I am crazy about the outside spaces even more. My favorite part is the playhouse. I just love that. Always a treat to see what you have found. I adore looking around others home, don’t you. But, what I really want to know is did you survive your spray paint fiasco. Where was that. You must post about it sometime. Another lovely home tour. My favorites, the pop or red with the white on the patio, and those crazy beautiful outdoor spaces. Also the fact Pam brought her childhood house with all the way from California – sweet. Thanks for sharing, Debbie and have a wonderful day. Pam.s house is lovely but the garden and yard is stealing my heart. It does every time I visit her too. Praise Be Debbie I got you on my Blog roll. It is fixed. It was worrying me so much. I am thrilled I can keep up better now. HappY Mother’s Day. Pam’s home is stunning, Debbie. Thanks so much for sharing it with us. I love Pam’s house and her style! I like the layout of her home too. 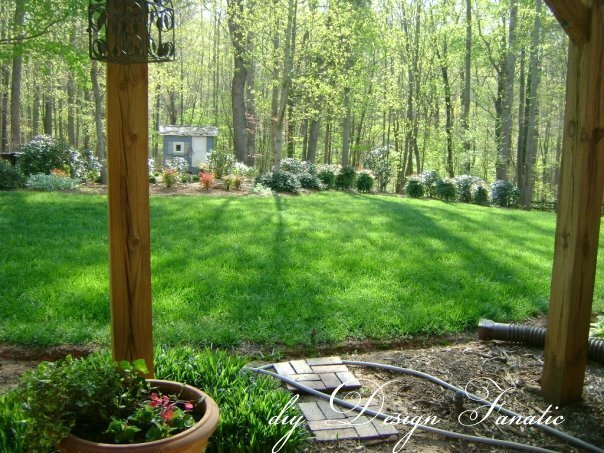 I am absolutely drooling over her lovely manicured back yard though. I also know she has a veggie garden in there somewhere as well making her yard pefectly wonderful. It’s soo pretty! Fabulous home! Thanks for the tour. Gorgeous house, I would love all of that room for storage! You are so smart to have your master on the ground floor. And your door greater is adorable! Such a beautiful home. The yard is my favorite! Thanks for the tour. Hi Debbie, I enjoyed seeing more of Pam’s house. They have done an amazing job with the yard and the interior. Thanks for another great tour and happy Mother’s Day. Your home is just beautiful, great style. 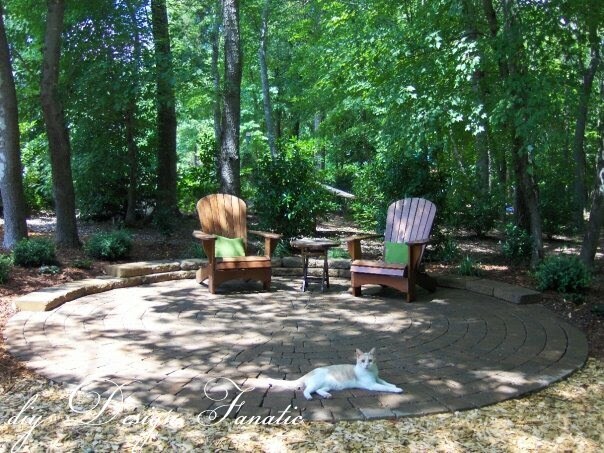 I love the circular patio, I would love to recreate something like it with vintage brick. Have a wonderful Mother’s Day. I enjoyed the wonderful tour. The property is beautiful and I adore Pam’s home. Thanks for the tour I enjoyed the backyard so much. Do you happen to know the dimensions of that master bedroom closet? We’re building a closet in a new house and I love that layout, so just wondering about how wide and deep it is. Thanks! Hi Natalie, I would suggest going to Pam’s site and directly contacting her. I am sure she can give you the details and dimensions.